Teresa Balser, one of three Fort Lewis College presidential candidates, answers questions on Wednesday during an open forum in Noble Hall. Balser is the dean of teaching and learning for the School of Engineering at Curtin University in Perth, Australia. Teresa Balser has a soft spot for liberal arts despite her doctorate in soil microbiology and undergraduate degrees in biology and earth sciences. 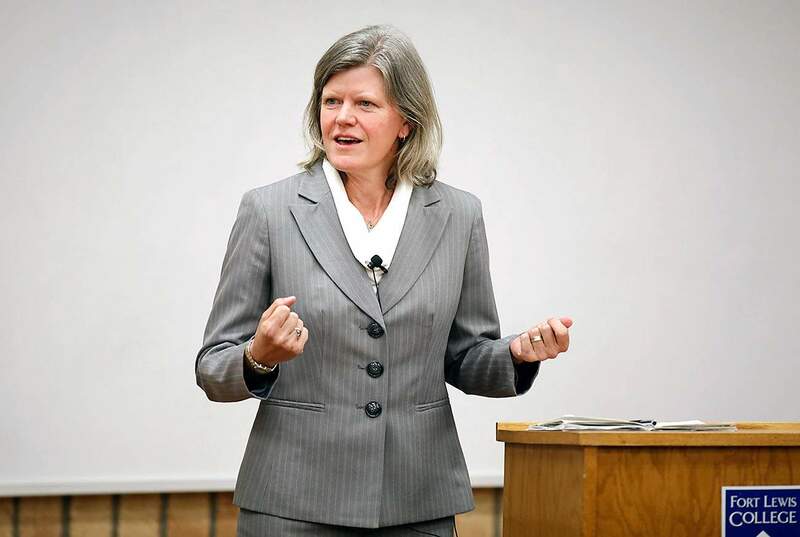 Balser is one of three candidates vying to assume the role of Fort Lewis College president after Dene Thomas retires at the end of the academic year. Balser is the dean of teaching and learning for the School of Engineering at Curtin University in Perth, Australia. Wednesday was not her first visit to Durango. Balser said she used to compete in cycling events around town and has always loved the area. Balser fielded a number of questions about declining enrollment and the subsequent budget cuts. A little more than 3,000 students call Fort Lewis College home – the lowest enrollment the institution has seen in more than a decade. She said re-evaluating the college’s four-year degrees and certificates might be one way to stem the decline. The college is considering several ways to stem the enrollment decline, including renaming the institution, which Balser said she neither supports nor opposes. Balser received her Ph.D. in soil microbiology from University of California-Berkley and two bachelor of arts degrees in biology and earth science from Dartmouth College. She previously served as dean for the College of Agricultural and Life Sciences at the University of Florida. Balser said she views students as more than just numbers at the college. In the same vein, Balser supports student activism and freedom of expression. Tom Stritikus, deputy director of K-12 U.S. Programs for the Bill & Melinda Gates Foundation in Seattle. Stritikus visited on Monday and Tuesday. Maria Guajardo, who is deputy vice president of Soka University in Tokyo, Japan, visited last week.The Board of Trustees is scheduled to meet April 13, when comments will be taken about the three finalists to replace Thomas, who will retire at the end of the academic year.Steve Short, chairman of the Board of Trustees, said he expects trustees to go into executive session after the April 13 meeting to discuss the three finalists. He said he expects a special Board of Trustees meeting will be set about a week after the April 13 meeting to announce the next president.